During the 1960’s, organized athletics enjoyed a popularity that was unmatched during previous times. Large crowds gathered to watch athletic contests, greater exposure was provided by the media and more young athletes became involved. Many of these young athletes were motivated to perform more aggressively to obtain an athletic scholarship or lucrative professional contract after college. Unfortunately, with the increased attention and involvement, serious injuries also became more prevalent. This was particularly evident in the sport of football where 36 fatalities were documented in 1968 from head and neck injuries directly due to participation in the sport in organized competition. To counter this trend, in 1970 the National Operating Committee on Standards for Athletic Equipment (NOCSAE) was formed to commission research directed toward injury reduction. Priorities had to be established because of limited funds, and research was directed where there was the most urgent need for a standard. Therefore, football helmets were targeted for the initial research effort. Several problems confronted NOCSAE in its attempt to address the head and neck injuries in football. One of the problems was the increased use of the head as the initial point of contact in blocking and tackling. The problem was how to draft helmet performance standards to protect a large, fast football player who might possess kinetic energy approaching 3,000 foot-pounds and to provide such an athlete with equipment that was protective, comfortable, durable and reliable. Researchers were also aware that despite the occasional peaks, such as in 1968, the incidence of head injury fatalities had been averaging less than two per 100,000 athletes. It was possible that the degree of protection had adjusted to the game and any radical changes would increase head injury. In addition to the above reasons, there were many unknown and uncontrollable factors about head injuries, i.e., the incidence of nontraumatic cerebrovascular disease death rate in the 15 to 23 age bracket for males was between 0.8 and 2.0 per 100,000. There was every likelihood that many young athletes with low tolerance for impact had participated in football undetected and were injured. Once the initial research was finished the work of establishing a football helmet standard began, and in 1970, a test system was designed featuring a humanoid head instrumented to determine the degree of hazard experienced by the model relative to a head injury criterion in a severe football impact simulation. The NOCSAE test standard was published in 1973. Voluntary changes which have occurred in football helmets as a result of research efforts include shell size changes, substitution of stiffer for softer materials. The equipment which was designed for the initial certification tests was installed in manufacturing plants and subsequently, the manufacturers assumed responsibility for certification. In a pioneering effort by one of the largest helmet reconditioners, installation and use of drop test equipment in reconditioning facilities in 1975 and subsequent testing found that 84 percent of the used helmets failed the NOCSAE test. The National Athletic Equipment Reconditioner’s Association (NAERA) was created very soon thereafter and became a member of NOCSAE in 1976. 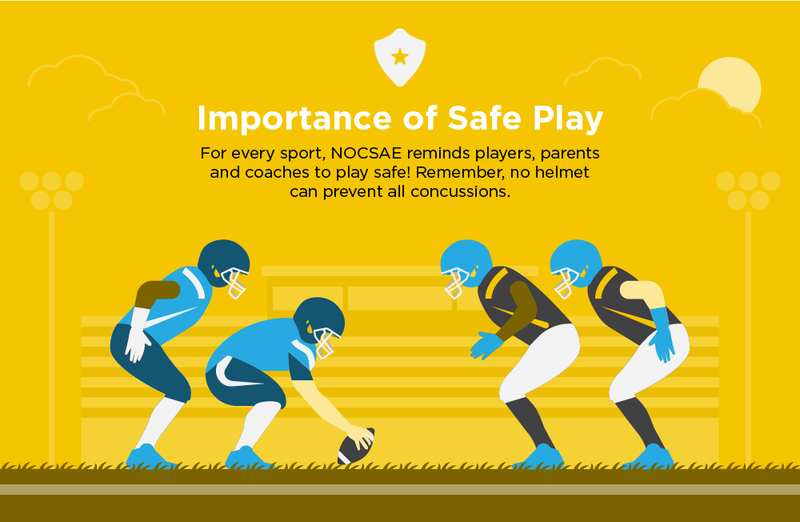 Recognizing its value to the safety and protection of athletes, a second NOCSAE Football Helmet Standard in 1977 was published and provided for recertification of helmets by reconditioners. National Collegiate Athletic Association (NCAA) rules mandated the use of certified helmets beginning with the 1978 season, and the National Federation of State High School Associations required the use of helmets certified to the NOCSAE standard for high school play, beginning with the 1980 season. By 1985 a significant downward trend in head injury fatalities was observed leading to zero deaths during the 1990 season for the first time since the beginning of annual fatality reports in 1931. Comparing the incidences of head injury fatalities for pre- and post-NOCSAE periods ranging from 1959 through 1990 seasons, from the National Federation of State High School records, a 74 percent reduction occurred. Of even more fundamental importance, the incidence of serious head injuries, the leading cause of disability and death in football, estimated to average 4.25/100,000 players in the 1964-68 era, immediately prior to the formation of NOCSAE, averaged only 0.51/100,000 players during the 2002-06 seasons, an 88 percent drop. 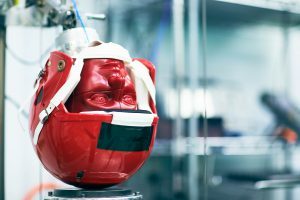 These results were very gratifying to a group which had confidence that helmets made and maintained to a severe head injury standard would also have a mitigating effect on other brain injuries, such as concussion. This is not to say that helmets were the sole injury reduction factor since warning and enforcement against spearing as well as other rules changes have also played a very significant role. During part of this period of progress and head injury reduction, permanent quadriplegia from neck injuries were averaging 20 annually during the 1971-1975 seasons. Rules makers recognized that the helmet-face mask combination had played a dual role by reducing serious injuries and lost lives on the one hand and yet inviting use of the head as an offensive weapon on the other. In 1976, rules-making committees were responsible for initiating changes which prohibited initial contact of the head in blocking and tackling. These changes have helped to significantly reduce quadriplegic injuries as well as other serious and fatal head injuries. Playing the game requires a team effort among players. Continuing to reduce the low incidence of head and neck injuries requires a concerted effort among rules makers, coaches, officials, equipment manufacturers, reconditioners and NOCSAE.